This year marks the 6th edition of Agnellotreffen – the highest motorcycle rally in the whole of Italy. Started in late 2013 by a group of friends, it now takes place annually in the snow covered Italian Alps, and hundreds of riders have flocked to the event in recent years despite the freezing conditions in the Valle Variata, in the Piedmonte region. Being in the middle of winter, and sitting 1,615 metres above sea level, this event is not for the faint hearted, but with all the good company, good food and plentiful drink on offer, it becomes possible to put the chilly weather to the back of your mind. 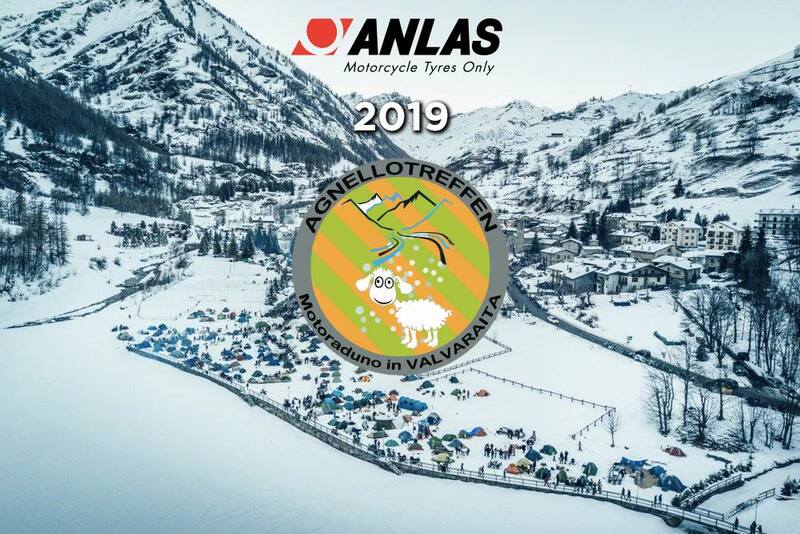 As the world’s only manufacturer of a winter tyre for big motorcycles, the event is an ideal opportunity for Anlas to showcase our Winter Grip range. This year the event will be sponsored by Anlas, with our Italian colleagues on hand to walk attendees through our current product range. All of the above tyres retain excellent durability if used all-year round, but they really come into their own when the mercury level drops thanks to the combination of specially formulated compounds and heavily siped tread patterns. These tread designs also make them extremely effective at clearing water on wet roads, which means they are popular with riders at all times of the year. If you’re at Agnellotreffen from 25th – 27th January, make sure you check them out for yourself!